"Florida Regional Art in Focus Exhibit"
I have been invited to participate in an exhibit of Florida Regional Art presented by Ruggie Wealth Management. The exhibit will be from January 11 through January 28, 2008 at the Lake Eustis Institute Exhibition Hall, 135 Grove Street, Eustis, Florida. The title of the art exhibit is "Florida Regional Art in Focus" featuring established Florida artists working as Regionalists. Each artist was invited to participate because of their professional art accomplishments and contribution to the arts in Florida. I am honored to be included in such an illustrious group. 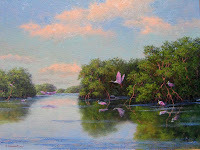 The exhibiting artists are limited to two paintings each, which will show a wide spectrum of art created in Florida. The following images are the paintings I will present. My first painting is titled "Enchanted Lagoon". 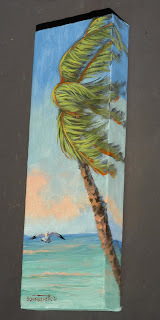 It was inspired by plein air painting sketches I did at McKee Botanical Gardens in Vero Beach on the east coast of Florida. Many north Florida residents are not familiar with the Royal Poinciana Tree, or Flamboyaunt (as it is called in Jamaica). It is not native to Florida but was imported to south Florida many years ago where it thrives, particularly in Miami and Coconut Grove. When in full bloom, it looses all of its fern-like leaves and puts on a magnificent display of firery red flowers. My second painting for the Florida Regional Art in Focus is titled "Jewels of Nature". It too was inspired by a plein air painting trip this time in my kayak on the west coast of Florida. There is nothing more beautiful than Roseate Spoonbills feeding among the mangroves. Spoonbills get their pink color from the food they eat, the pinker and more plentiful the shrimp, the pinker the birds. This should be a spectacular exhibit and exciting event. If you can attend any of the receptions/lectures/auctions you will gain a wealth of information. If you are interested in attending all of the events you will get a GREAT DEAL. Tickets are only $70.00 for the opening night reception and lecture AND the Black Tie & Blue Jeans Gala and Art Auction. I am not pushing the tickets, just giving you information. The FREE Florida Regional Art in Focus Exhibit is the thing I hope you won't miss. It is shaping up to be one of the most spectacular art exhibits in the state. I plan to attend the opening night reception on January 11 and the Gala on January 25. If you attend please let me know, I would love to meet you. I am pleased to report that my holiday show featuring small oil paintings at Picture Perfect Gallery and Frame Shop in Ft. Pierce, Florida, was great fun. I saw many long time friends and made some new ones. The miniature paintings were well received and a number of them found new homes. I also included larger paintings in the show to round out the exhibit, some of which also sold. I hope to make this an annual event. If you would like an invitation please let me know. You can email me through my web site (http://www.floridalandscapes.com/) or post a message here. The first paragraph of my last post did not get published. I sure don't know why. So, I will try it again. I have finally returned from my trip to Ft. Pierce on Florida's east coast. I am happy to report the "MINI" show was a great success. I thoroughly enjoyed creating the small paintings and people were happy about being able to purchase the "MINI" paintings at "MINI" prices as gifts. This may turn into an annual event. I am finally back from my trip to Ft. Pierce on the east coast of Florida for the opening of my art show. I am happy to report that it was a great success with the "MINI" paintings being well received...and purchased. Featuring small paintings was a first for me. The paintings were fun to create and people enjoyed picking up more affordable, original art for gifts. This just might turn into an annual event. I also took the opportunity to spend a couple of days with friends who own a ranch in the area. This is some of the most beautiful, natural Florida landscape I have ever seen. They are building a wonderful new home on the property and want a painting, so we set out to find the perfect scene. After many hourse of riding we decided on the venue. 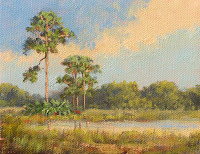 The painting will have the viewer in a dense Florida hammock, looking out through the sprawling live oak trees covered in spanish moss and reserection fern. In the distance will be a sun drenched grouping of Sabal Palms and palmettos in the tall, wild natural grass. I can't wait to get started! They don't need the painting until April when the house is expected to be finished. So, that gives me time to work up sketches and compose the layout. Because it will be a large painting I will paint a miniature, to scale, for their final approval. I will post info as the project progresses. "Very Merry MINI Art Show and Sale"
While I was out painting en plein air recently I was thrilled to see this flock of White Ibis feeding in the shallow marsh. They stayed quite a long time and I was able to make sketches and take photographs for reference back in the studio. The painting is on gallery wrapped canvas measuring 6"x12" priced at $325.00. Today is my last day to paint before leaving for Ft. Pierce to deliver the collection for the "Very Merry MINI Holiday Art Show and Sale". Which means I will be in the studio painting all day. Sounds like work....but I love it. I am pleased to say I will have about 25 mini paintings plus my normal size paintings available for the show. I havn't had time to photograph and post all the paintings. If I get a chance this afternoon, and the sun cooperates, I will photograph more and get them posted tonight before I leave in the morning. Another "Very Merry MINI Holiday Show" painting. It measures 4"x5", perfect for a table display on a small easel. The canvas is gallery wrapped so there is no frame to bother with. If you have no more wall space but still like to buy new paintings this is just for you. These are fun to paint. If you are an artist give it a try if you havn't already. If you are a collector these mini paintings add a new dimension to your collection. And the best news is that it sells for only $100.00...what a bargain for an original oil painting. I havn't quoted prices on the previously posted paintings, but I will tomorrow. And add a new painting for you to see...if it is dry enough to handle and photograph. This is another block canvas painting 4" x 12". It is three dimensional with the painting continuing around the sides, top and bottom. It is a challenge to think in 3-D and then paint it. But what a lot of fun! I have a number of new paintings underway for the show Opening December 12 at Picture Perfect Gallery and Frame Shop in Ft. Pierce. This collection of small paintings I am creating especially for the exhibit and sale range in size from 12"x16" to 2" x 3" and are affordably priced for Holiday Gift Giving. I will also have larger paintings available. I think I am beginning to get more comfortable with the blog format. At least the placement of the paintings are coming up a little better. I hope you will visit again tomorrow to see another painting. Since you are reading this it means you have decided to return for one more post. The paintings were too wet to handle last night, so they did not get posted. But, I am up early this morning ready to get the job done. These first two paintings are in a new foremat for me. They are painted on 4" x12" Gallery Wrapped Canvas and are very deep, extending out from the hanging surface. They are intended to be displayed unframed. I have two pictures of the same painting. One is the direct front image and the other is a side image to show you how the painting wraps around the side. Well, I just added the pictures. But I did not intend for them to be way up there at the top. I havn't figured out how to move them so I will leave them for now. Remember, I am still trying to figure this out. I have to get back to the easle. I will play with this again later. Hopefully I will get better. This is my first attempt at blogging. If you will stick with me I will get better. "A Very Merry MINI Holiday Show and Sale"
I will be posting the paintings as they are finished until show time. Please visit the blog to see these little gems (as a collector has referred to them) and check out their great prices. They are right off the easle as I finish each one. The first painting will be posted this afternoon, so check back then. Remember, giving a gift of original art is like giving a piece of history.